Learn about the many Jewels of the Salton Sea and how VITAL it is to our planet. In a soon to be released feature length TV documentary, researcher Grace Yang shares her experience of traveling to the Sea for over one year. It's a long way from China to the Salton Sea says Grace Yang. 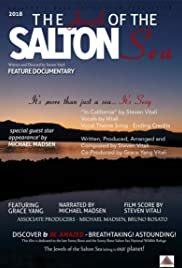 Experience the Salton Sea as never before with a compelling soundtrack in its own right by chart topping, and award winning composer, arranger Steven Vitali. This documentary features many important interviews with extraordinary and inspiring people, and a special guest star appearance by the incredible actor and poet Michael Madsen.